If you have encountered any sort of life changing trauma, be it cancer, loss of a loved one, loss of a job, or some chronic pain, you know that even soundless tension can also register as noise and set your spirit on edge. I experienced this when I contracted Tinnitus. It was as if a switch went On that I could never turn Off. The ringing in my ears was and is like the whine of a jet engine that never goes away. Fifteen years later, I still long for “the sounds of silence.” Perhaps you’ve been in a situation where you’ve had to closely attend to medical routines, medications, or pain levels. So much mental focus becomes unbearably ‘noisy’. If you endure such an experience, you might come to experience an appreciation for a quieter, slower pace of life. Some things that once seemed urgent become less important. It’s fine to want to be excellent in what you do, but it really doesn’t add any value if you sand the studs before you put on the drywall, if you know what I mean. There are seasons of life that are busier and noisier than others and we all have to get through those and enjoy them the best we can. But if you find that life has become too noisy and hectic, perhaps it is time to make a list of how you can slow down. In business we used to ask, “What needs to stop and what needs to start?” “What do we need to do less of (or stop doing entirely because it just wastes time) and what do I need to do more of?” Try it. You’ll be glad you did if it leads you to slow down and enjoy a bit more peace in your life. And for ultimate peace, turn down the noise in your life and turn to God. Spend quiet time meditating on and memorizing His Word. If you are too busy for God, you might be too busy. This entry was posted in Faith, Living With Purpose and Passion and tagged be quiet, Isaiah 26:3, meditate, memorize, noise, noisy life, peace, slow down, sounds of silence, Tinnitus, Too busy, too busy for God, turn to God on October 7, 2014 by Bryan Thayer. Do you know what these are? They are called onggi, Korean fermenting pots. We saw these in an historical palace and also in the patios and rooftops of houses and restaurants throughout the cities. 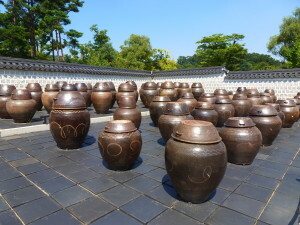 They have been used for the last 6000-7000 years to create unique sauces made from foods such as red chili peppers, beans and rice paste, cabbage, soy sauce. Not exactly fast food, it takes months to prepare the specialty sauces. I think fermented foods demand an acquired taste and obviously requires much patience to obtain the final product. There is a similar concept applied to thinking that also has been around for thousands of years: meditation. From the beginning of history, God’s people were instructed to meditate on His Word, day and night. To meditate means to think deeply or focus one’s mind for a period of time. Some synonymous words include: contemplate, think, consider, ponder, muse, reflect, deliberate, ruminate, brood, mull over. Meditation is not like reading the headlines of the news. It is thinking deeply about something, not unlike letting it ferment in your mind, breaking down the large ideas and letting them stew until you can absorb the richness of flavor offered by truth. Like fermented foods, meditation requires patience and deliberation. We in the western world are not very accustomed to fermented foods or to meditated thinking. We’d rather go for a quick bite to eat and listen to 30 second “sound bites’. We can all understand this: meditation, like preparing a thickened sauce, takes time. And we are all so famously busy in this fast paced day and age. We might not know where our busy life is taking us but we are getting there so very quickly! Like the husband who says, to his wife while driving, “I know we are lost but we can’t stop now because we are making such good time!” We encounter problems and want quick and easy solutions, ones that cut to the chase. That approach to solving problems works with some things. But some problems and trials in life are more complex and require more complex solutions. The problems of pain and suffering, disappointment, grief, injustice and feeling unfulfilled are not resolved by a diet of fast food problem solving. The more one has contemplated and meditated on God’s truths, the more one is prepared to work through these issues with a greater sense of satisfaction and acceptance. But it takes time. And none of us can add a single second to our days. We have to choose how to invest our time. Choose today to remain quiet a little longer. You can do it. Let your thoughts ponder the wonders of God, the miracle of His presence, His unending love and His amazing grace, even the miracle that He created in you. Do this every day and throughout the day so you can be strong and courageous, ‘prosperous and successful’ in the things that matter most. This entry was posted in Faith, Living With Purpose and Passion, Memories and tagged fermenting pots, Joshua 1:8-9, Korea, meditate, onggi, strong and courageous on September 20, 2014 by Bryan Thayer. This entry was posted in Faith, Living With Purpose and Passion and tagged As far as possible be on good terms with all persons, Desiderata, Go placidly amid the noise and haste, Max Ehrmann, meditate on February 4, 2014 by Bryan Thayer.